Fred Rogers created a world where children could learn about the world in a safe and loving environment. He talked to children about all kinds of topics including death, divorce and racism. At a time when some white people were blocking and harassing black people in public swimming pools, Mr. Rogers had Officer Clemmons, played by Francois Clemmons, share a foot pool with him, to demonstrate acceptance, equality and friendship. While they were sharing the pool they were singing “There are many ways to say I love you”. See Francois’s comments in this clip. So where did the magic come from. I would say the magic came from the stars. Fred Rogers was born on March 20, 1928 into a human design that is on the cross of the Vessel of Love (VOL). Powered by the Love gates and led by his lead gate of Universal Love, Fred was born into a design to show that everyone and everything deserves love equally. In Fact, I think it was the universal quality to his love that made it so appealing. As you may know, there are 4 variations of VOL’s and I think another flavor may have slewed his energy in another direction. 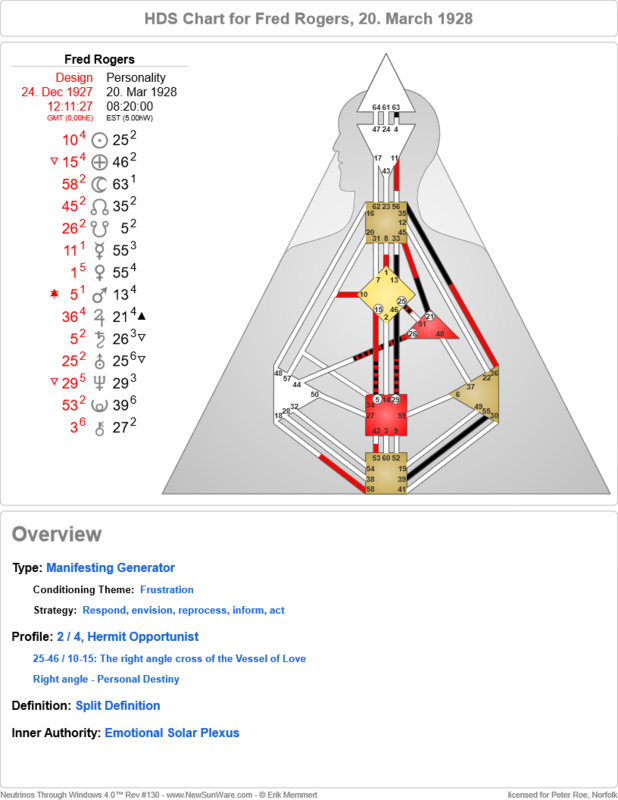 For example, if he had Lead Gate 1o, Behavior of the self it might have felt more judgmental; or the lead gate 46, Love of the body, may have been more into physical stature or appearance; or the lead Gate 15, Love of Humanity, gate of extremes, might have gone off in a more specific direction. But he was just universal, the love was just there, persistent, present in all directions in everything he did. Here are a couple quotes by him that we could all take to heart. The last part of the quote, “love or the lack of it” is something a Vessel of Love knows innately. Seeing love, being in the presence of love is like water or air, VOL’s need it to survive and thrive. Based on the descriptions of his upbringing and his life it seems he was well nourished. So while the magic was in the seed of his design, his life and his actions allowed it to flourish. He followed his passions of music, flying, swimming and TV. He wanted to go into TV because he felt it was a powerful tool that was not being used for education. Boy, did he change that. Fred’s Vessel of Love, gets extra power from his sacral center, with the channel 29-46 to say yes and push through getting it done, and the channel of rhythm 5-15 to flow when it is ready to flow. In addition, he has a well powered throat, with the 21-45 powering it with heart/will energy and the 35-36 providing the emotional energy to have and ride out the experience. Reading his history on Wikipedia, you can see his manifesting generator path, responding to opportunities presented. He transferred after a couple years in college to focus on music. He was at NBC and decided to move to a local TV station to work as a puppeteer. In fact during that time he developed some of the puppets that became characters on his show. It was at this station, a few years later that the 2-4 opportunist got his opportunity to create his show that ran for over 30 years. His 2-4 profile was likely beneficial in creating his opportunities via the 4th line. Also, both the 4th and 2nd lines to added to his VOL qualities in making approachable, while the 2nd line got invitations as well as invoked some quiet time to absorb, digest and naturally develop dialogue for children on challenging subjects. All along he delivered sometimes challenging messages with an underlying blanket of love. His work didn’t stay within the boundaries of the show as he was a champion of 5 human rights issues. More on that here. So did the design make the man or the man make himself? I would say a lot of column A and and a lot of column B. We all have magic and gifts within our designs. They are just the seeds and it is up to us to become aware of them and maximize the potential. Be a great neighbor! Here is a trailer from a new movie out about Mr. Rogers and his great work.